In recent years, the idea of planting native plants has swept through the gardening world. Native plants are great for attracting wildlife. They are adapted to our climate, and they are equipped to handle our severe fluctuations in rain fall. But most importantly, native plants give a sense of place. These are the plants that let you know you are in the South. One native that stands out among all others this time of year in the American beautyberry or Callicarpa americana. This native shrub puts off an incredible show of purple clustered berries in late August through in the end of November. First the flowers, then berries occur in the axils, the area located where the leaf stalk connects to the branch. The beautyberry blooms throughout the summer with clusters of pink to purplish flowers. As beautiful as the berries are, the flowers of this shrub offer no significant landscape value. Once the flowers are pollinated and berries form, this native shrub certainly becomes the belle of the ball. This highly attractive shrub can be found growing naturally at a woodland’s edge. Therefore, when gardeners incorporate beautyberry into the landscape, choosing an area that receives part sun to part shade will the ideal location. This shrub can grow in poor soil conditions such as thick clay to sandy or rocky soils, as well as highly acid areas and thin, infertile soils. This may come a relief to some gardeners: soil prep and amending typically will not be necessary to grow a desirable shrub. Though this tough shrub requires very little soil prep, it is still always good practice to have your soil tested before planting. 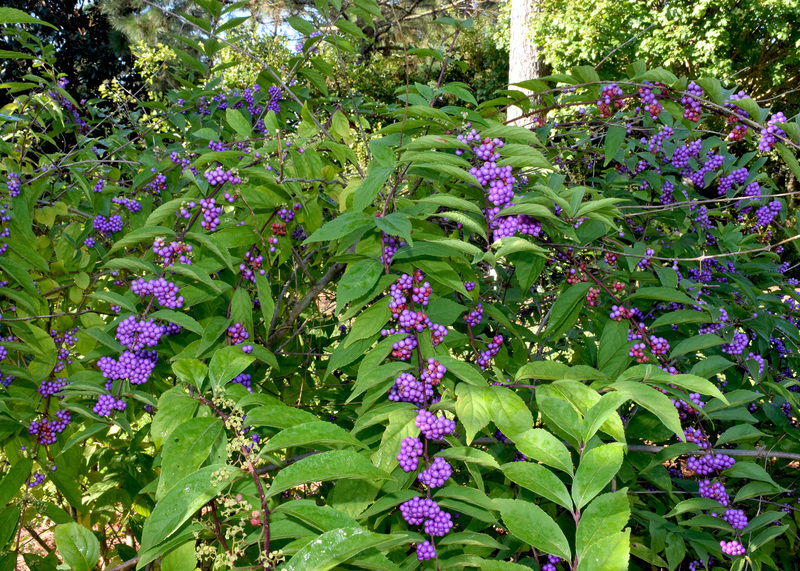 The beautyberry can grow rather large quickly, easily reaching 10 feet. One notable characteristic of this shrub is that is blooms on the current year’s wood. This means if the shrub grows too tall for your landscape, you can prune back severely in late winter, even to the ground if you need. 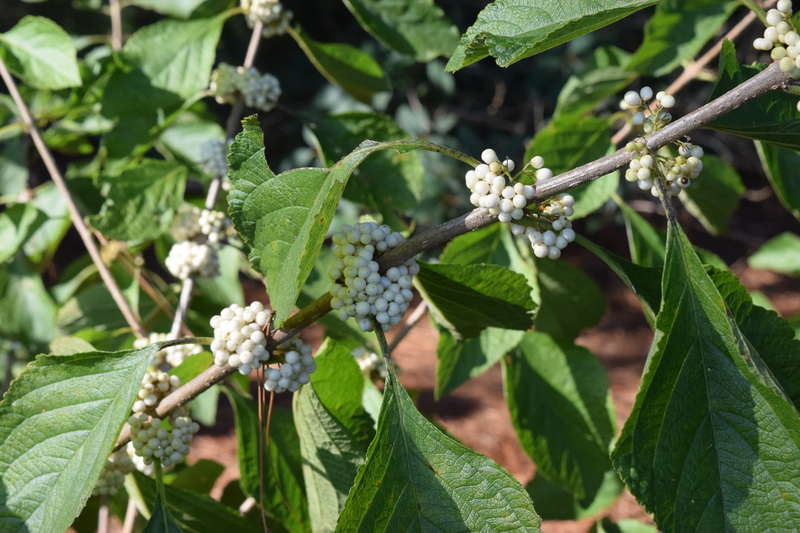 The following spring, the beautyberry will put on new growth and will bloom from those stems. The beautiful purple berries don’t persist on the plant for an extended period time as they play a very important role for birds in the autumn. 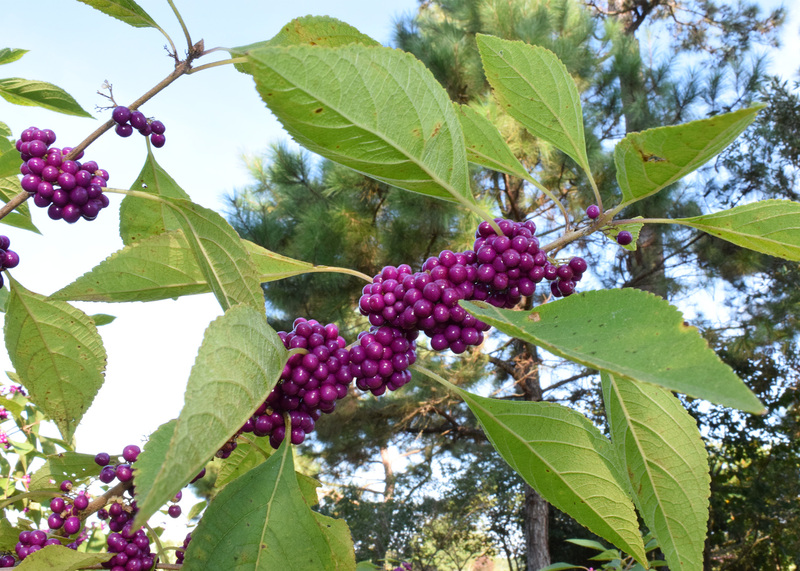 Because our fall dry period occurs the same time the plant has berries, birds will use beautyberry as a water source. More than 40 song birds can be found feeding on beautyberry, including catbirds, cardinals and mockingbirds. Callicarpa includes many cultivars and other species, but they are often difficult to find in garden centers. A cultivar called Bok Tower is a green-foliage shrub with white berries. 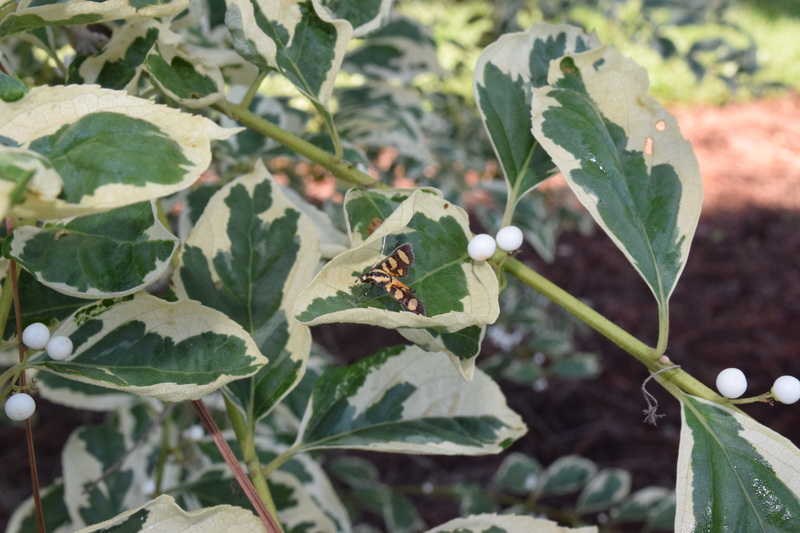 Another cultivar,duet, has variegated foliage in combination with attractive white berries. Other selections include Bonner Creek and Purple Pearls, a weeping purple berry and even a variety with striking pink berries. Check local garden center for availability or collect seed this time of year from a friend to incorporate into your gardening area. So long as you don’t mind sharing with the birds, the Callicarpa species work in tandem with the rest of your landscape to bring fabulous fall color to the garden.